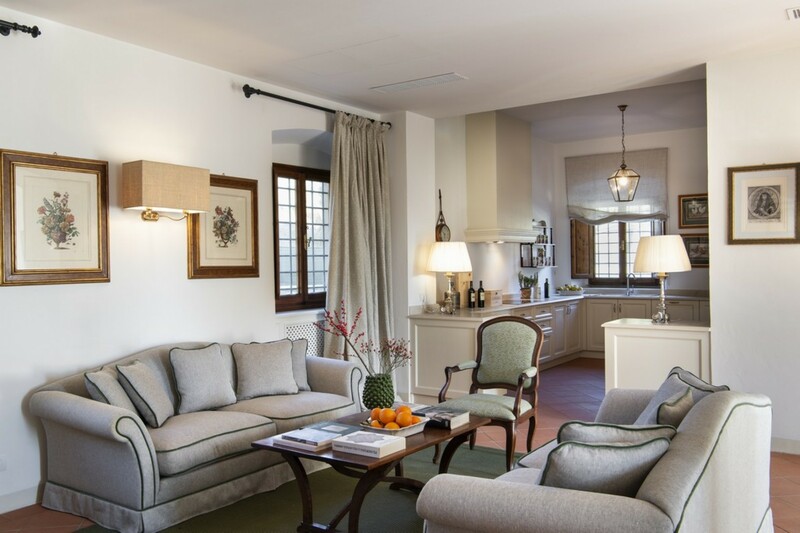 Welcome to Villa Carolina, a luxury 5-bedroom villa located in Reggello in the area of Florence in Italy. Villa Carolina is a large estate that was recently renoavted in 2018. 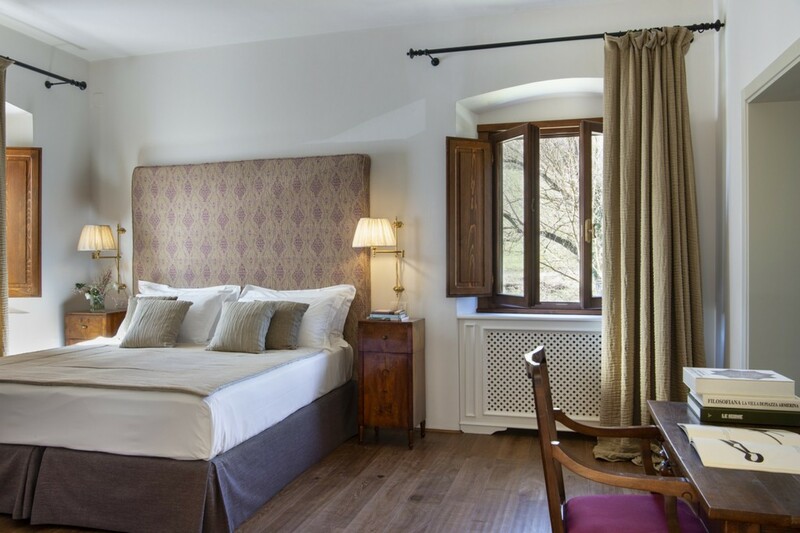 Set in the charming valley amidst the mountains of the Apennines and the Arno valley. The estate is comprised of 70 hectares and features Cypresses and centuries-old sycamores. Guests love to relax in this stunning home which has an ideal location. 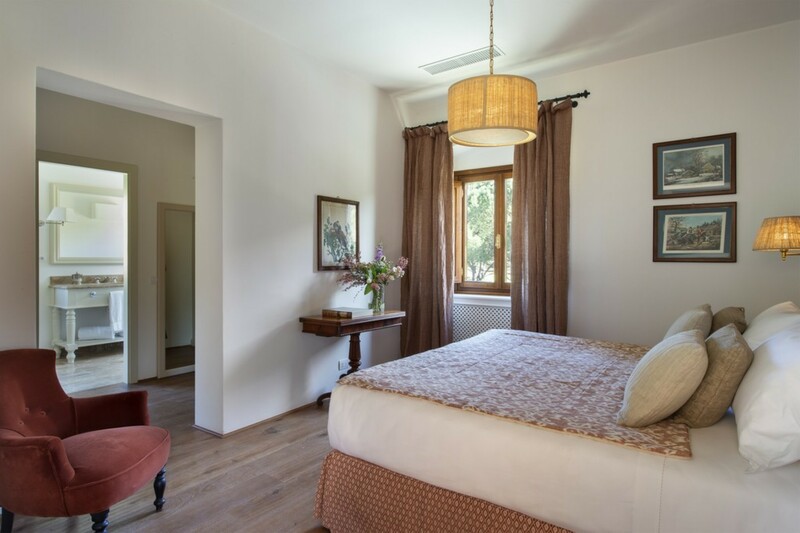 Villa Carolina is just 1 km from the town of Figline Valdarno, where you will find local amenities including shops, banks, restaurants, post office, and hospital. 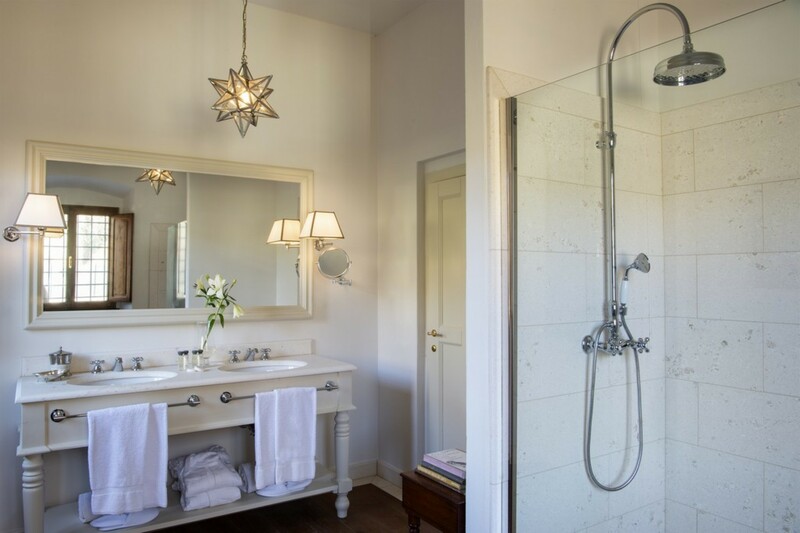 The location is particularly convenient as it allows you to reach Florence in 30 minutes (28 km). 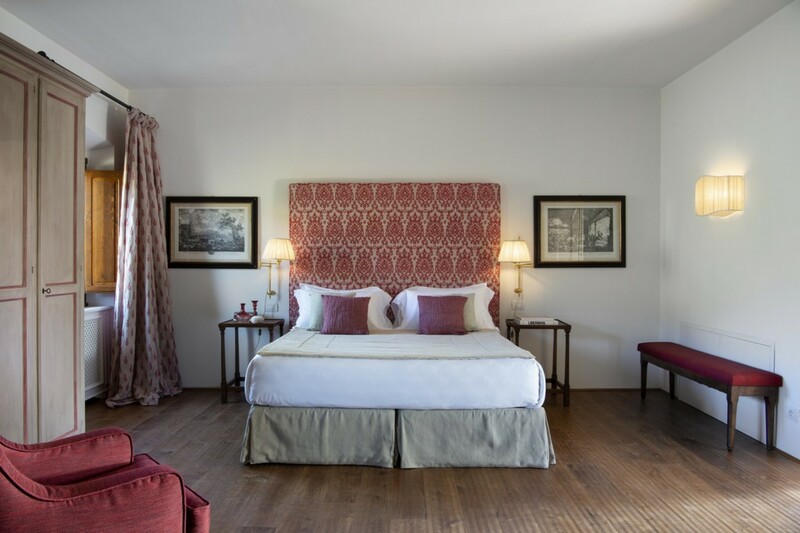 The Estate expands over approximately 70 hectares of Tuscan countryside, is composed of 7 main villas and three cottages. It is a fenced property and each Villa has its own private outdoor parking. 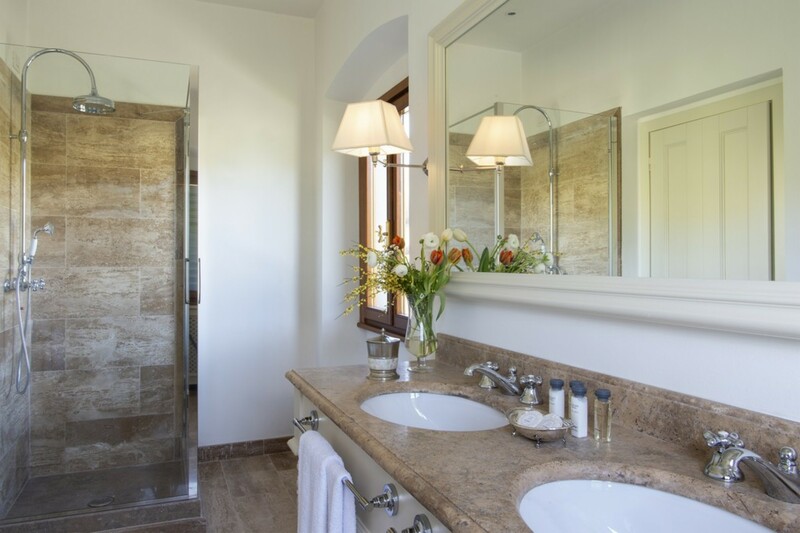 Each villa has its own private pool, surrounded by lawns and gardens with lovely views and offer complete privacy. 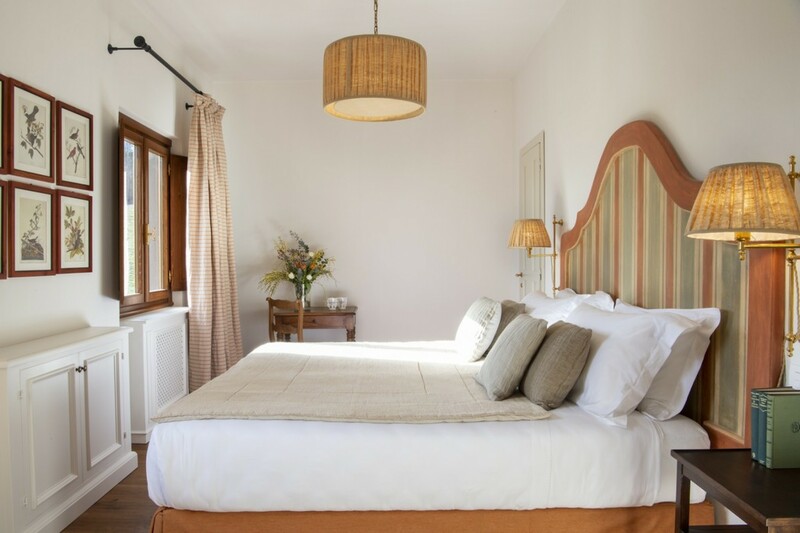 They are perfectly kept and furnished with elegant garden furniture and comfortable sun loungers. 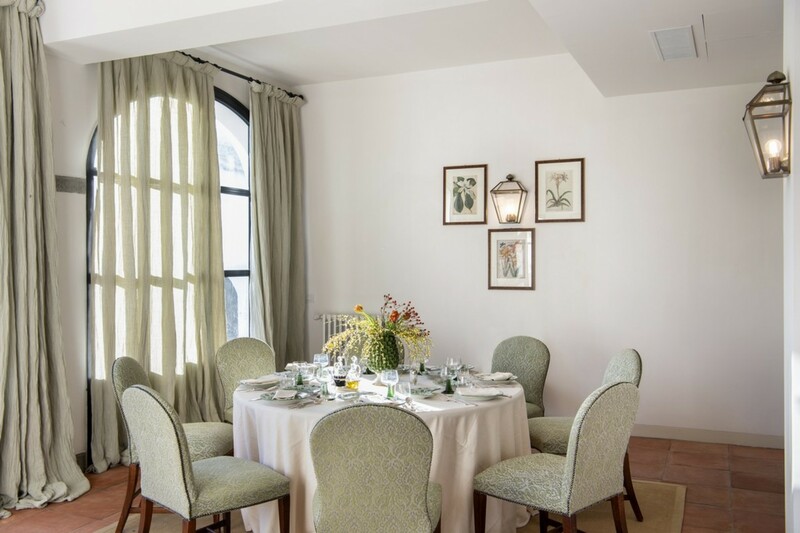 At the center of the Estate you will find shared areas which include a reception area open from 9.00 to 12.00 and 16.00 to 19.00 h.. There is also a lovely shop on the estate for guests to purchase some basics such as quality wines, organic extra virgin olive oil, organic jams and honey, pasta, and many other delicacies. 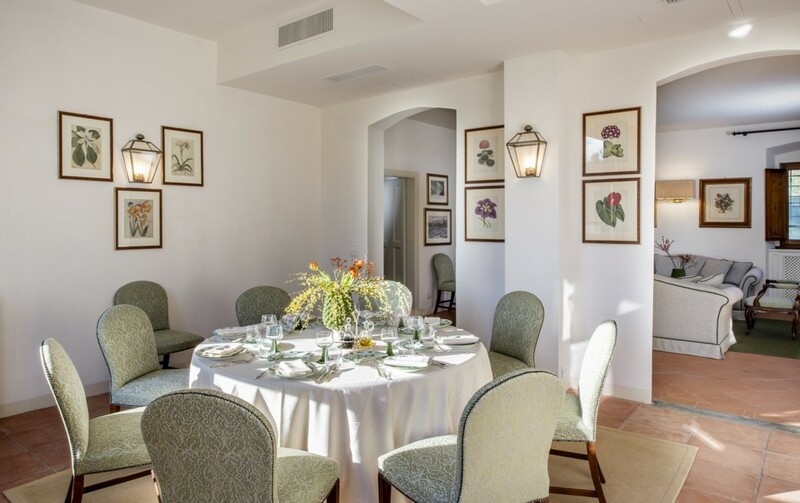 There is as an outdoor tennis court for guests use, all of which is surrounded by 70 hectares of of amazing Tuscan countryside and romantic Italian gardens. 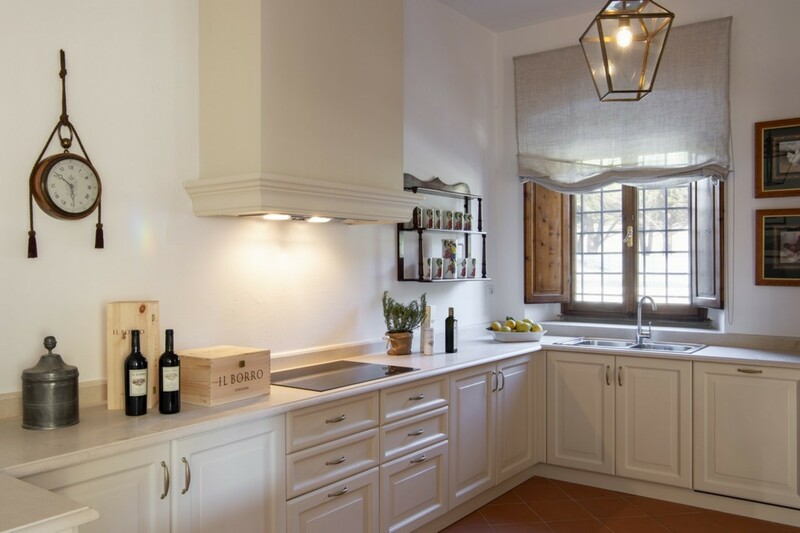 This luxury 5 bedroom Italian rental is located only 30 minutes from Florence and not far from the Chianti area. Siena, San Gimignano, Montalcino, Cortona, Arezzo, all easily reachable through scenic roads of motorway. The villa is an excellent accommodation for a family holiday or for a group of friends. 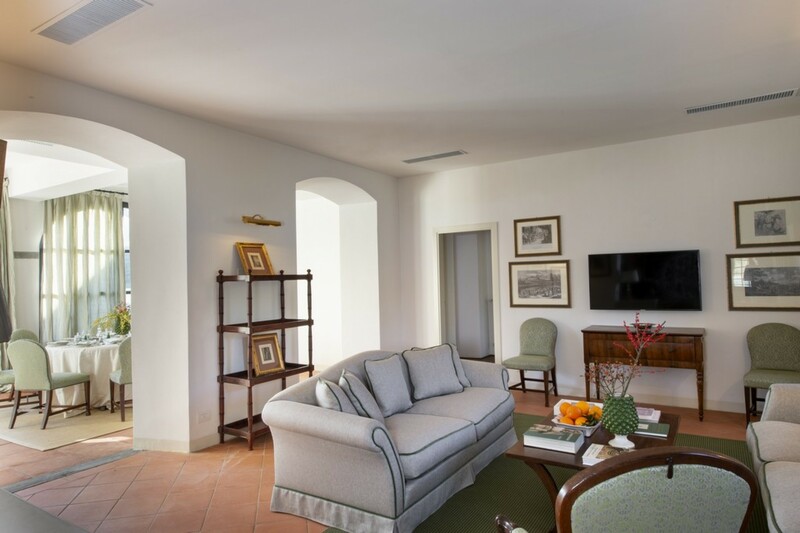 The villa is built on 3 levels; on the ground floor there is a bright entrance, a double lounge with beamed ceiling, a very large dining room and a fully equipped kitchen. 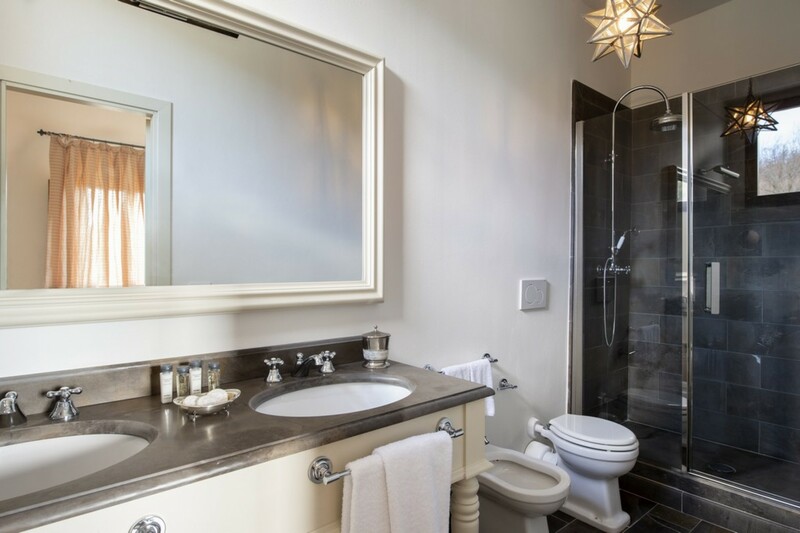 On the same level you will find a double bedroom with en-suite bathroom (walk-in shower) and a private walk-in closet. On the first floor an entrance leads to a common living room and to 3 of the double bedrooms: all with en-suite, large and comfortable bathrooms with walk-in showers. On the upper level of the property you will find the last of the 5 bedrooms. 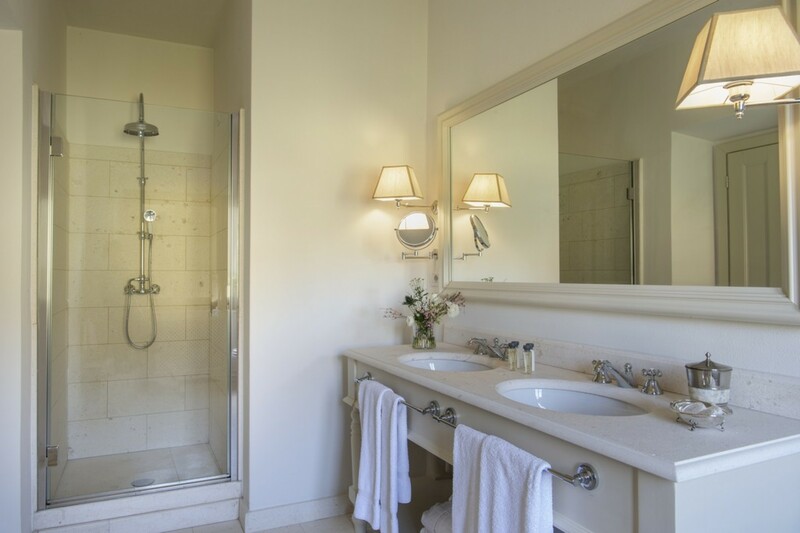 This large double bedroom has an elegant en-suite bathroom with a large shower. 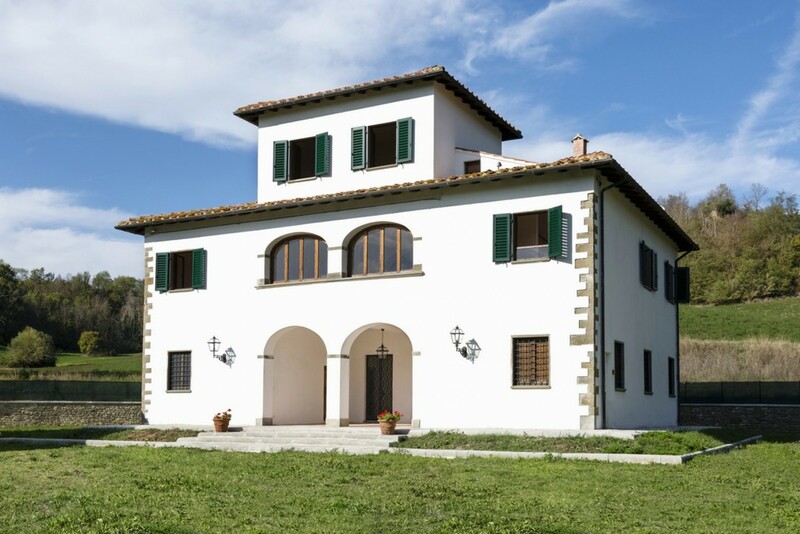 From its 2 windows, it offers a wonderful view over the Tuscan countryside. The property boasts a large swimming pool equipped with comfortable sun lounges, outdoor facilities and a BBQ area. There are breakfast tables with comfortable chairs, a beautiful fountain in the garden. • Electricity, Air/Co, heating, water, gas, final cleaning and VAT. • Daily change of bath towels. • Copy of passport and permanent home address of each guests to be provided prior to check in. • Only authorized staff and personnel are permitted to be onsite. This includes but is not limited to chefs, cooks, housekeepers etc. Talk to you Villa Specialist today for more details. 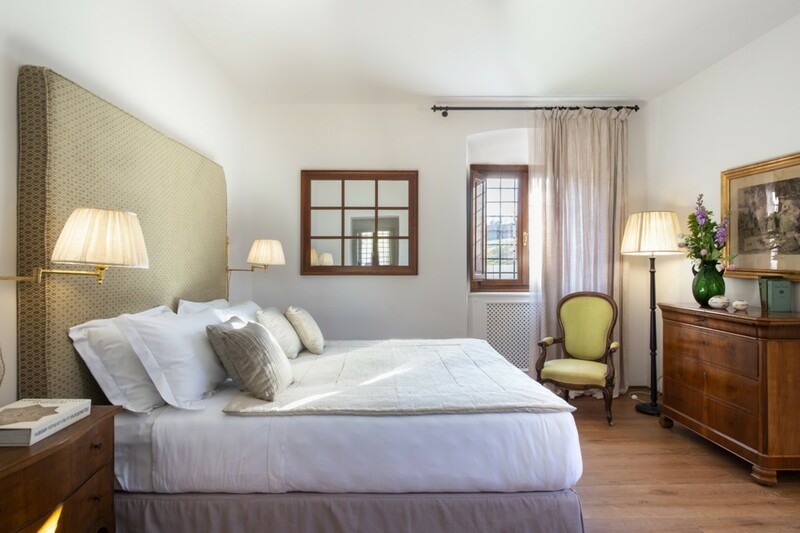 Villa Carolina has been newly renovated in 2018. 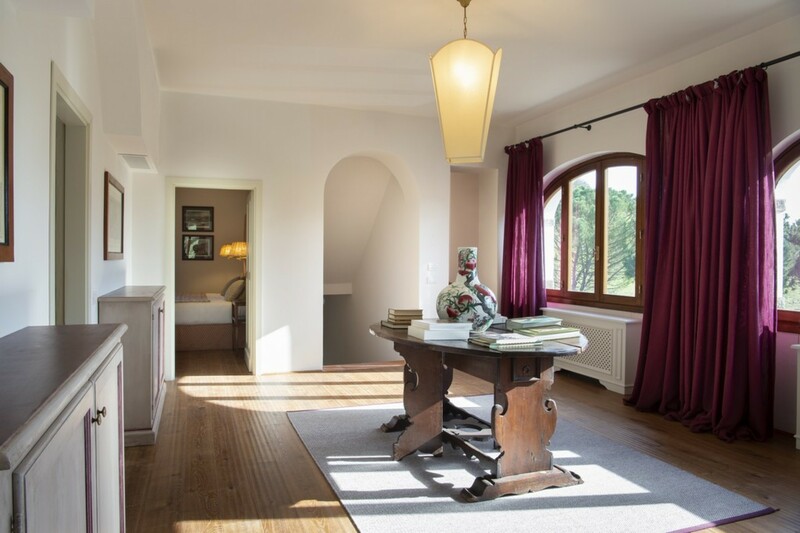 It is a private property situated in a splendid position inside a large estate, in a charming valley set between the mountains of the Apennines and the Arno valley. Cypresses, centuries-old sycamores and poplars enrich the 70 hectares of ground that surrounds the complex. The Estate is located around 1 km from the town of Figline Valdarno, where all the essential amenities (shops, banks, restaurants, post office, and hospital) can be found. The location is particularly convenient as it allows you to reach Florence in 30 minutes (28 km). Nearest Town: Regello, Figline Valdarno, southeast of Florence. • Figline Valdarno - 1 km (where shops, banks, restaurants, post office, and hospital). Florence - 28 km (30 min drive).